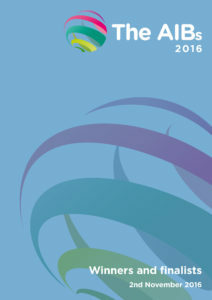 Read the Winners and Finalists book to find out who won in the AIBs 2016. You’ll discover what our judges said about the winning entries and who received high commendations from our international panel of jurors. 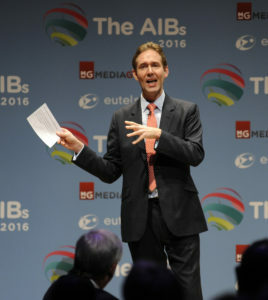 Mark Barton, Bloomberg Television’s longest serving presenter in Europe, the Middle East and Africa, hosted the AIBs 2016 – the twelfth international awards for the best factual television, radio and online productions. The event took place in London on Wednesday 2 November 2016, and celebrated the work of producers, editors and journalists from around the world. Work from nearly 40 countries was submitted to the AIBs in 2016 and the shortlist included work from major broadcasters, online video companies, newspapers and independent producers. Mark Barton played an integral role in establishing Bloomberg Television as a global financial and business news network. Mark has witnessed at first hand three global recessions and covered five UK general elections and five US elections. Mark has travelled the world to interview more than ten thousand newsmakers. They’ve included Presidents, Princes, Prime Ministers, members of the US Federal Reserve and most of the global business elite. Among his personal career highlights are Microsoft founder Bill Gates and the late Israeli leader Shimon Peres.